Acid rain is hugely destructive to stone monuments. Photo source: Wkimedia Commons. Today, something I didn’t know much about (luckily not a huge problem in little old NZ), but I was interested to learn more. Read on if you too are curious about acid rain, what it really does, and what can be done about it. Acid rain is a mixture of wet (rain fog and snow) and dry (dust and smoke) materials, which contains above average amounts of nitric and sulfuric acid. These acids form in the atmosphere when emissions of sulfur dioxide (SO2) and nitrogen oxides (NOx) react with water and oxygen. There are natural emitters of the chemicals released, such as rotting vegetation and volcanic eruptions, however most of it can be attributed to anthropogenic (manmade) activities. The biggest contributor to atmospheric SO2 and NOx is fossil fuel combustion. Countries that produce energy by burning coal (such as China and the U.S) have elevated atmospheric SO2 and NOx. As measures have been taken to decrease this, vehicle emissions are making up a greater percentage of acid rain producing emissions. 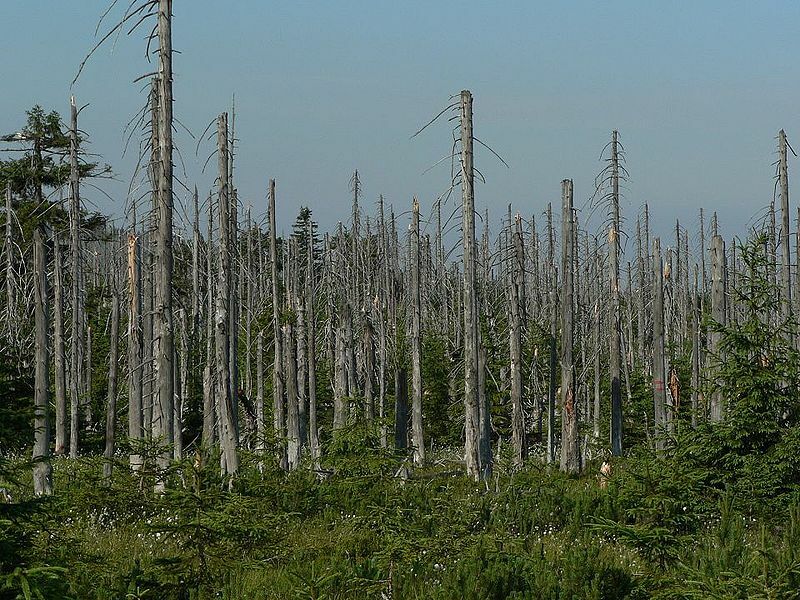 Acid rain can kill forest ecosystems, as can be seen in this forest in the Czech Republic. The most harmful effect of acid rain is its impact on our waterways. Prolonged and persistent acid rain can change the pH of water from a healthy 6-7 to an acidic 5-6. Acidic runoff releases aluminum from the soil, increasing toxic runoff into waterways, which is harmful to aquatic ecosystems. When pH falls to 5, many fish eggs are unable to hatch, and the population may decline. At a pH lower than 5, adult fish may die. Acid rain can also be harmful to terrestrial ecosystems. It can damage forests, and the released aluminum in the soil retards water and nutrient uptake by plants. The lack of nutrients can kill leaves, and increases the trees vulnerability to other harmful processes, such as climate extremes. It is not only the natural world that acid rain harms. 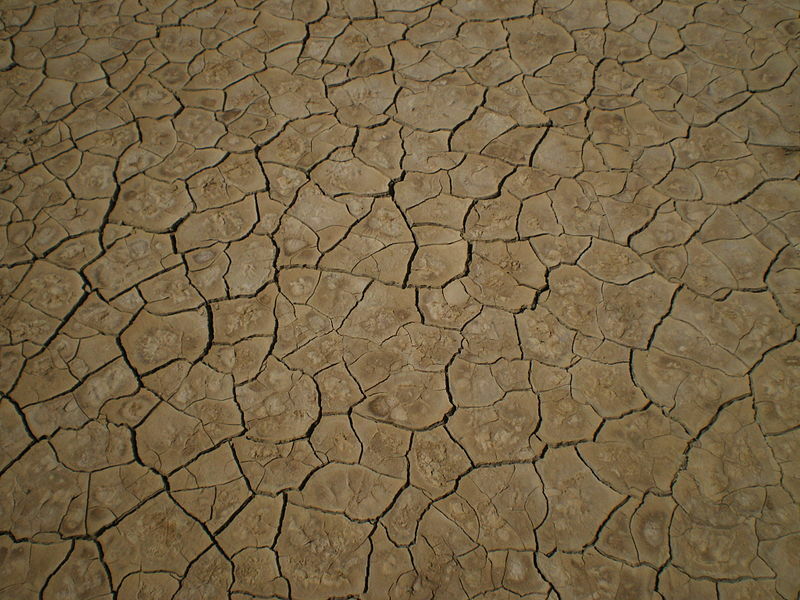 Acid rain can erode paint on cars, and dissolve limestone and marble buildings. The cost to paint a car using acid resistant paint is $5 higher per car than to paint it using non acid resistant paint. In the U.S this adds up to $61 million per year. On the bright side, there is no direct adverse effect on humans who are exposed to acid rain. However, the particles of pollutant in the atmosphere that cause acid rain do have a negative impact peoples lungs, and are related to asthma, bronchitis and emphysema. There may be a positive side effect of acid rain. Researchers have found that acid rain may reduce the amount of methane (a powerful green house gas) produced by wetlands. This is due to competition between bacteria that live in the wetlands. Acid rain boosts the number of the bacteria which thrive on sulfur, which in turn reduces the number of methane producing bacteria, therefore methane emissions. After withstanding the elements for 1000 years, the Leshan Giant Buddha in China is being slowly destroyed by acid rain. Photo source: Wikimedia Commons. China is the third largest acid rain region (behind Europe and the U.S), and burns over 3 billion tons of coal per annum. In 2011 it was reported that 258 Chinese cities experienced acid rain according to official statistics. 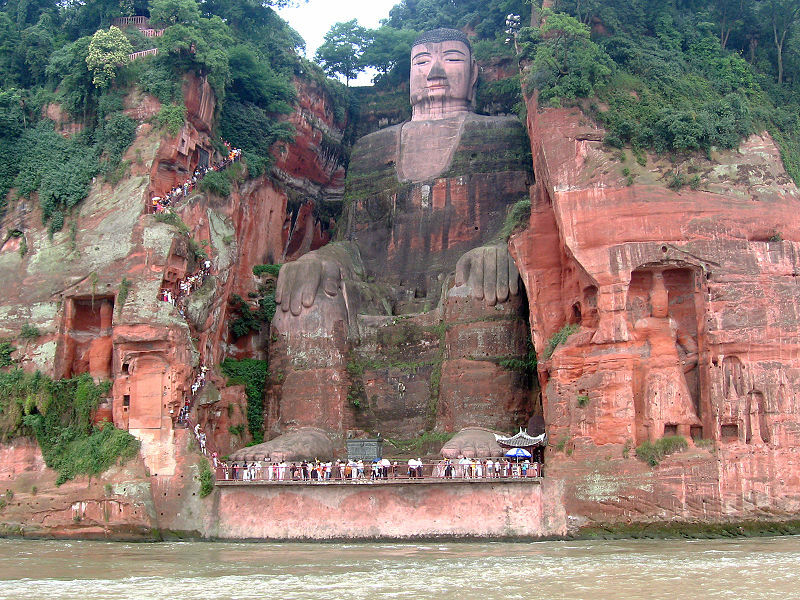 The Leshan Giant Buddha, is an ancient statue carved from a cliff, is 1000 years old, and the largest Buddha in the world (standing 71 meters high). Sadly, the Buddha has been badly affected by the acid rain. Its nose is turning black, it hair is eroding, and its reddish body is becoming a charred grey colour. The best way of limiting the effects of acid rain is by limiting the causes of it. Reducing burning of fossil fuels, using less energy, or finding alternative energy sources are the most effective ways to combat acid rain. In October 2007, American Electric Power (AEP) settled a lawsuit for failing to take the necessary steps to mitigate the impact of acid rain, brought against it by the Environmental Protection Agency (EPA). Despite denying any wrongdoing, AEP settled the case by promising to spend $1.6 billion to upgrade its coal powered plants. With continuing legal challenges, public pressure, and sound legislation, such as the EPA’s Acid Rain Program, we can hope there is an end in sight for acid rain. Furthermore, as coal fired plants and vehicle emissions also contribute to the enhanced greenhouse effect (global warming action on one can only have positive effects on the other, effectively killing two very environmentally destructive birds with one stone. Agricultural pollution...Wairarapa New Zealand. Photo source: Wikimedia Commons. So far I have been looking at the amount of water we use, and hopefully, managed to convey the idea that some things we do use a lot of water in a rather unsustainable way. Luckily for us, the fresh water system is generally cyclic and renewable. However, there are some practices we as humans do, that have the potential to seriously (and irreversibly) damage the environment, and consequently harm ourselves. Today I’m going to introduce you to the issue of water pollution. It has to go somewhere, doesn’t it? While in New Zealand there is legislation in place regarding the treatment of your toilet bowls before it is pumped out to our rivers and oceans, many other countries are not so lucky. The United Nations tells us the 2 million tons of human waste are disposed into water courses daily. That isn’t treated waste, or dirty water, that’s what comes out of us, and into our rivers and oceans. Again, we are lucky to have regulations in New Zealand, but many developing countries do not. Having to treat waste before discharging it is expensive, so there is an attraction for factories to be built in places that are unregulated, therefore decreasing operating costs. 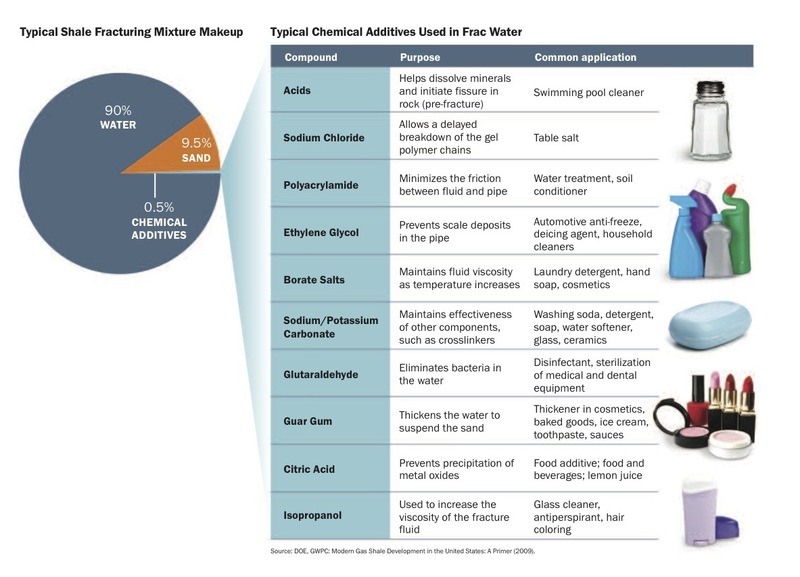 Industrial processes often include by products such as PAH’s (more to come on this), oils, ores, acids, particulates (both organic and inorganic), pharmaceuticals, dyes, detergents, plastic, and more! 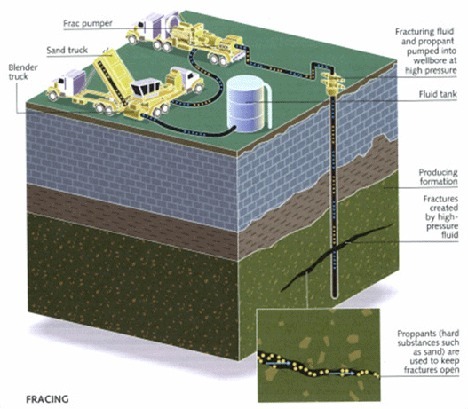 In some places these contaminants flow out of a pipe and straight into the nearest river. Stock effluent is high in nitrate and ammonium, and this combined with phosphate based fertilizers set up a perfect environment for eutrophication to occur. Eutrophication refers to nutrient enrichment, which typically promotes algal growth, decreases oxygen supply in the water, and damages the ecosystem. Eutophication may kill organisms including phytoplankton and fish, while toxic algae may harm humans and other large mammals (we often hear of dogs dying after they have been in contact with toxic algal blooms). 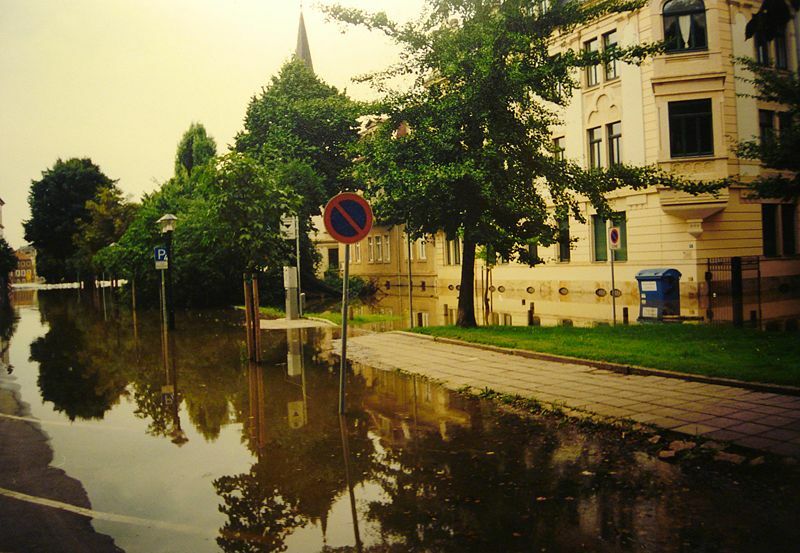 Our urban environment promotes runoff rather than infiltration, as buildings and roads create impervious surfaces requiring storm water drains to remove rain water, rather than natural processes. Heavy rain has the effect of washing away contaminants which have built up on the road surfaces. This typically includes by-products of transportation, such as petrol and oil, as well as heavy metals including copper zinc and lead. It sounds dreadful, doesn’t it? But really, we are in no position to vilify these polluters. We must stop and ask ourselves: Whose toilet is it that flushes into the rivers? Who buys the products from those who pump their industrial waste into waterways? Who demands cheaper produce from the supermarket? And finally, whose cars drive around the cities emitting noxious particulate pollutants? Yes, we must take some responsibility for these issues. But! There is hope. By changing our perceptions, and telling those who make the decisions that we will not support poor environmental practices we do have the chance to put some of these wrongs right. It is my belief that this is a very significant subject, and to gloss over it would be to do it an injustice. So, for my next few blogs, I aim to discuss each of these pollutant issues, looking at what is going wrong, and most importantly, what we can do about it. So why blog about water? 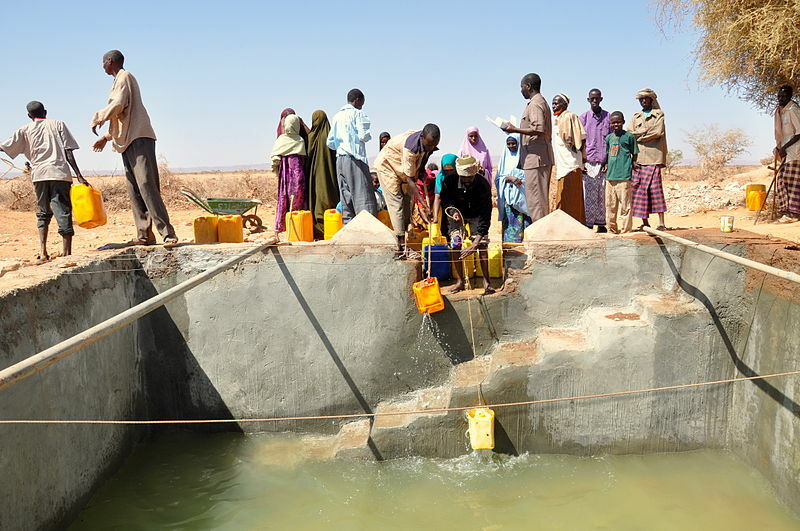 These Somalian villagers collect water that has been trucked in by Oxfam. Due to a severe drought, this is their only water supply. Each person get approximatly 7.5 liters per day, well less than the UN's estimate of daily water requirements. Source: Oxfam East Africa. For us as humans water is vital. The United Nations estimate that a person need at the very least, 20 litres of water per day for drinking, cooking and cleaning. However, 894 million people worldwide (one in six) do not have access to safe, fresh water. In the developed world this is little more than a sobering statistic, clean, drinkable water pours from a tap. But in third world nations 1.5 million children die per year from illnesses because they either can’t access water at all, or the little they can lacks even the most basic sanitation. Yet even if we were to provide sanitation to every person in Sub Saharan Africa, we would still be faced with many unresolved issues surrounding water. This leaves us 13, 000 km3 of fresh water, spread unevenly across the globe. In New Zealand we are lucky to have a surplus of this precious resource, while our neighbours across the Pacific are often challenged by drought, forcing them to restrict water use, and raising grave concerns for the future. If we throw the looming threat of climate change into the equation, things become more fraught and uncertain. 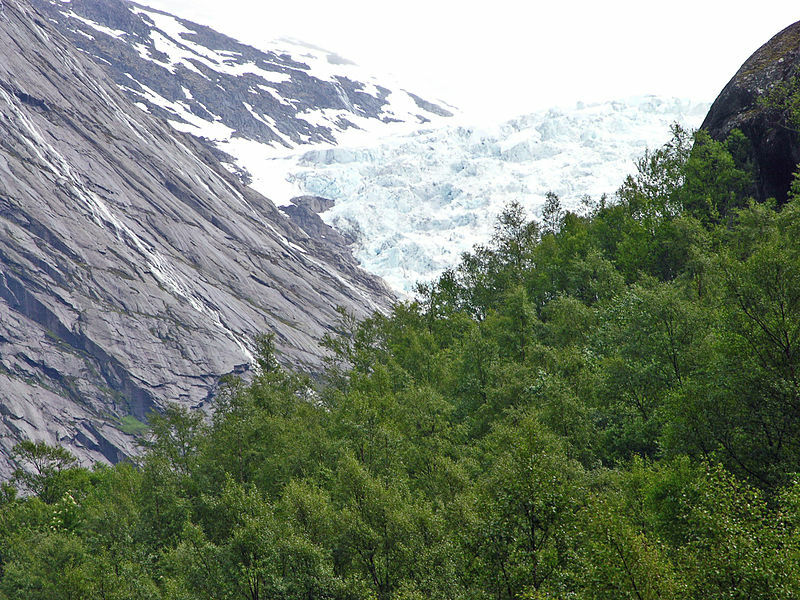 With summer ice and glacier melt being a huge source of water to millions of people, the loss of alpine glaciers is likely to have a devastating effect. And the part that I find most frustrating? Despite all these challenges, New Zealand is both economically and geographically blessed when it comes to fresh clean water. Yet this is a stroke of luck we use and abuse. A study conducted in 2009, which tested rivers across North America, Europe, Australia and New Zealand, found that the Manawatu River (located in the central North Island) was one of the most polluted rivers in the study. 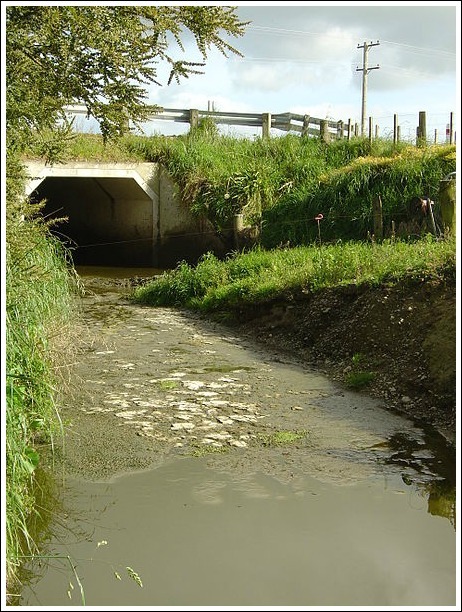 The Manawatu is contaminated with treated sewage, industrial waste and agricultural runoff. This is a sad fact indeed for New Zealand. With such a range of issues, from poverty to scarcity, climate change to wilful damage, there is a lot for me to discuss about water. But when it really comes down to it, I guess my motivation is the fact that freshwater is a relevant topic for every single person on the planet.